I am still a bit "semi-detached" from full Forum activities after a nasty illness (or group of conditions) laid me low recently. I am beginning to recover some energy and hope to be back on full form in due course. Shortly before falling ill, I had the good fortune to purchase a really nice quartz Braun travel alarm clock - a slimline analogue example with pull-down front cover on the inside of which are printed details of World Time zones.The design of this clock follows in the main stream of beautiful modern clocks and watches that emanated from Braun during the celebrated Lubs/Rams period from about 1970 to 2000, and I estimate that my Type 4785/AB313 came out in the early or mid-1990s. 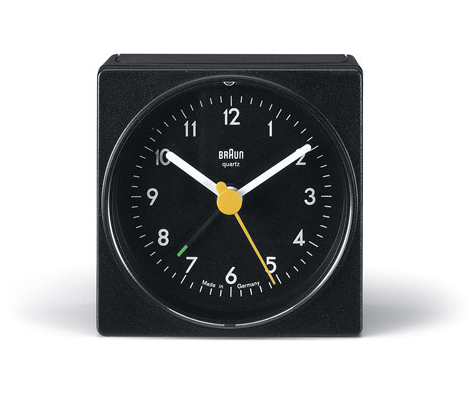 Just to digress for a moment, the Braun quartz analogue alarm clock that is generally regarded as being the most iconic of the Lubs/Rams period, because of its minimalism and "exclusive" inclusion of design elements favoured by Lubs and Rams is the Braun AB1, originally designed by Dietrich Lubs in 1971 and updated in 1987, by then some years after Dieter Rams and Dietrich Lubs had developed and matured their characteristic Braun analogue and digital clock styles using contemporary technology for differently specified models. I have to say here that there seems to be a discrepancy among sources whereby it may be that the AB1 was not actually designed until 1987, some time after the analogue Braun clock design style had been established. Note just how similar are the two AB1 clocks shown here below, and we know that a version of the clock was designed by Dieter Lubs in 1987. Having digressed, I now return to my own (mint condition and still boxed with instructions) Braun Type 4785/AB313. When I purchased the clock for £3.99 in a charity shop, I noticed that it was working and I presumed that someone had installed a new battery at some stage, so left the battery in for a while. Later, I remembered that I had not checked the battery compartment to make sure that the battery was actually OK and not leaking, so I opened the compartment and found that the battery was not actually leaking but seemed to have been used before, in another device. When I removed it from the clock, I was amazed to see that the "Install by End" date on the battery was January 2002. Thus, the battery in my clock had been around for about 17 years and was still viable. And it wasn't as if it was a high-end battery either in the sense that it was a "Tesco Extra Long Life Alkaline" AA example. I know that members have periodically expressed similar experiences with batteries that are viable way beyond their use-by dates, but I thought I would just share mine. For those of us who like a few "factoids" to chomp on might like to know that in December last year, Energizer(USA) was awarded the Guinness Book of Records citation for the world's longest lasting AA battery. The particular product tested for this accolade was their Energizer Ultimate Lithium AA. In addition to this battery having an acceleratedly long life in use, it can apparently also be kept in storage for twenty years prior to first use. When it comes to batteries in general, nothing it would seem has yet matched the Oxford Electric Bell (also called the Clarendon Dry Pile) which has been ringing since 1840 without additional assistance, and even now there is a question as to what the two dry pile batteries consists of. The apparatus comprises two brass bells, each suspended beneath a battery, with a 4mm metal sphere swinging between them via electrostatic force at a rate of 2 Hertz thus ringing the bell. Originally made by instrument makers Watkin & Hill, the bell was sold to professor of physics Reverend Robert Walker. It is currently located at the Clarendon Laboratory in the University of Oxford, protected by a bell jar of double layer thickness. Dear @Always"watching" another very interesting article. 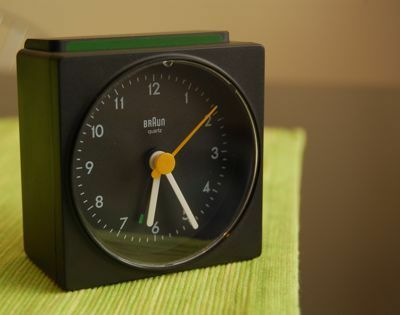 I have always had a soft spot for those Braun clocks as I had one myself when younger. I wish you a full and speedy recovery. Hope you get well soon,I owned both of this type back in the day.